Is it possible to print invoices on my pre-printed forms? How do I transfer the invoicing program to a new computer? Buttons on the Excel sheet stopped working. Why? How do I work with multiple companies or currencies on a single computer? How to protect a template / limit access to the invoicing system? Why my invoices are marked as paid unintentionally? How do I install Invoice Manager for Excel Helper manually? How to deal with the "Access to path 'path-full-name' is denied" error on installing Invoice Manager for Excel Helper? Is there a way to hide permanently the left and right hand sections of the main invoice xlsx and have only the invoice part? How do I change from one template to another? How do I remove auto-created macros? How do I share or link common data (customers / products) between two Access databases? How do I remove the background image from the printed invoices? 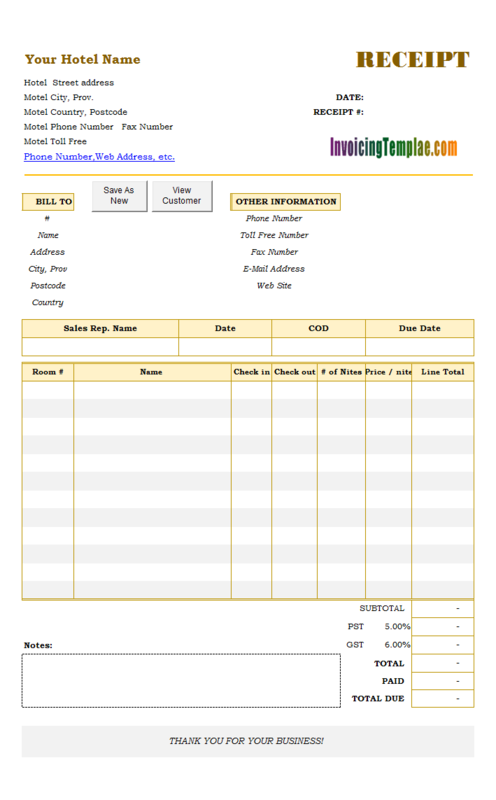 QUESTION: I would like to customize an invoice so that it will print on our pre-printed invoice forms. Is this possible? ANSWER: Yes this is possible, although the process is somewhat tedious - You have to try again and again to make it print fine on your existing form. However, the rules for customizing the invoice template are simple. Switch to design mode by pushing down the "Design Mode" button on the "Invoice" ribbon tab. Click to select the cell you want to move. Drag the border of the cell to move it to the new location you like. Repeat the above steps to move other cells if needed. Save the template by clicking Excel menu File -> Save. To set font size, color, border etc. Right-click the cell/cells you want to format, choose Format Cells. Click the arrow button in the "Page Setup" group on the "Page Layout" ribbon tab. To preview the printed page, click Excel menu File -> Print. Once finished, click Excel menu File -> Save to save the template. Transferring or moving Invoice Manager for Excel to a new computer/system means installing the program on a new computer/system and having it work with your existing data, including the invoice template, database, etc. This tutorial goes through the steps required. Download and install the invoicing program on your new computer. The setup program installs a standard template and a sample database on your new computer. However, what you want is your existing data, which we will copy to your new computer in the following steps. There are 2 types of data files you need to copy from the source computer: the template file and the database file. Right click the shortcut icon with which you open your template, choose Properties from the menu. The Target field shows you the exact path and file name of your template. On the source computer, open your template as usual. Go to the Database tab. The Current Database field shows you the exact path and file name of your database. This is the database file that you should copy to your new computer. On the target computer create a folder for the data files, such as "C:\MyInvoice" or a subfolder "My Invoice" inside "My Documents". Make sure your Windows account have full access privilege to the folder. Open the template file on your new computer. It may prompt for a database. Browse to and open the database file you copied from the source computer. If it does not prompt, click the Settings button on the Invoice worksheet; go to the Database tab, and then click the Open Database button to open the database file you copied from the source computer. Click Excel menu File / Save. This saves the default database path and name in the template file. 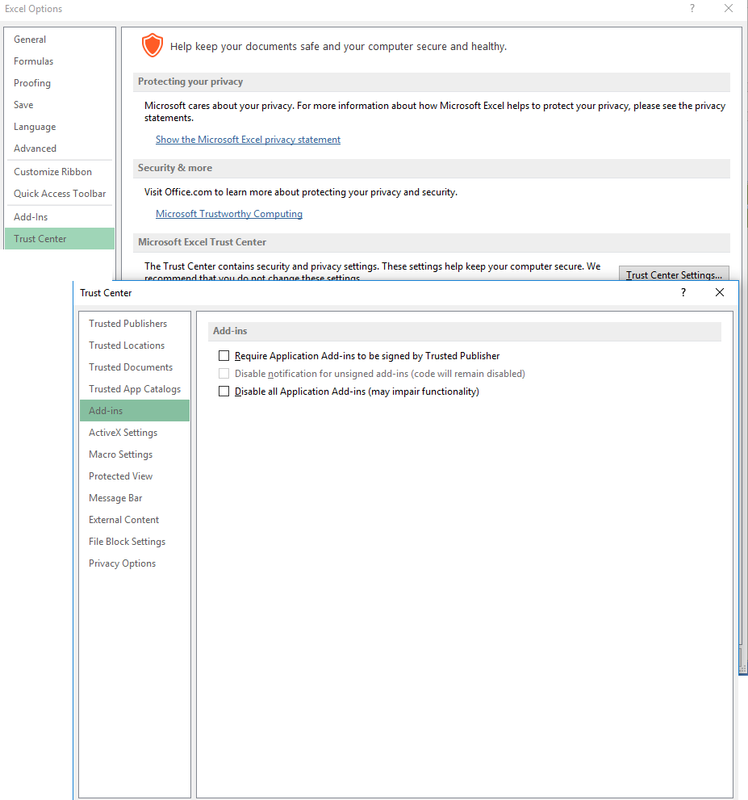 The template will open or connect to the specified database file automatically next time you open the template. Click the "Download" button in the "All formats in a self-extracting zip package" section. Double-click the downloaded file to extract all files. Open the template, which is a ".xlsx", ".xls" or ".xlsm" format. Click "Design Mode" on the "Invoice" Excel ribbon tab to put it into design mode. Click "Design Mode" again to exit design mode. If you click a button on the Excel sheet but get no response from it, first check if you can find the "Invoice" ribbon tab shown on the figure below. If the ribbon tab shows correctly, but the buttons on the sheets don't work, check if the template is in design mode. If the "Design Mode" button on the ribbon is pushing down, the template is in design mode. Click the button again to exit design mode. If you cannot find the, Invoice Manager for Excel might not be running at all. Restart computer to close all the hidden instance of Excel that might be running in the background. If you still cannot find the "Invoice" ribbon tab, try to download and install Invoice Manager for Excel again. The default setup options in the installer program do not overwrite your data files if they exist. So you can just download and install without uninstalling your existing program. Download the latest version of Invoice Manager for Excel. 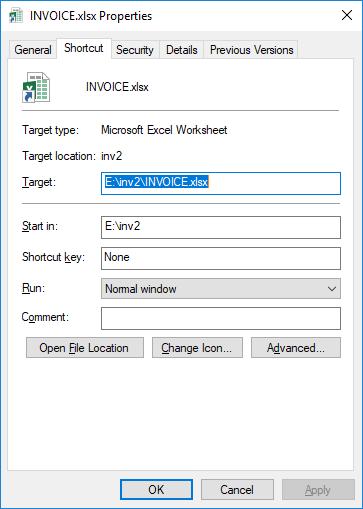 After installing Invoice Manager for Excel, open your invoice template again. If you still cannot find the ribbon tab shown on the figure, try to download any template here on InvoicingTemplate.com, try it to see if it has the ribbon tab shown correctly. If the template downloaded from InvoicingTemplate.com works, but your template don't, send us your invoice template for a check. The default security setting in Excel is sufficient for Invoice Manager for Excel (Excel Invoice Manager) to run. 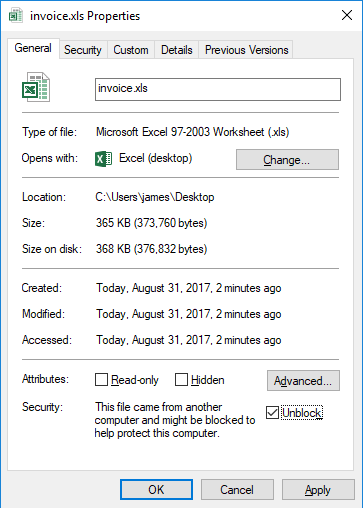 However if you have changed the security setting there are chances that Invoice Manager for Excel cannot run on your computer. In Excel 2007 click Excel menu Office button -> Excel Options; In Excel 2010 - Excel 2016 click File -> Options. Make sure "Disable all Appliation Add-ins (may impair functionality)" is not checked. If "Require Appliation Add-ins to be signed by Trusted Publisher" is checked, make sure you add our publisher certificate to the trusted publisher list. Restart Excel if you make changes to the security options. Click Office button, and then click Excel Options. In case of Excel 2010 or 2013, click File and then Options. Click "Add-ins" on the left pane. Do you see "Invoice Manager for Excel" listed on the dialog box? If it is not checked, check it now and then click OK. If the computer joined a domain, make sure the domain administrator didn't create security policies to prevent your Windows account from installing new software programs. With a single copy of Invoice Manager for Excel installed on a computer, you can work with multiple companies / currencies, each with a different invoice form design and even database fields. The idea is to create a pair of invoice template and database file for each of your company or currency. To make it clear, it is recommended to create a folder for each of your company or currency. However creating a folder for each of your company or currency is not mandatory. As long as your files have different names, storing all the files in one same folder works just fine. Note the "Standard" edition allows you to open only one template at a time. If you need to open the second template, you should close the first one first. See Differences between editions for more information. Assuming you have two companies that both use a similar invoice form you have, here are how to project your invoicing system. Create a subfolder for each of your company. Make sure your Windows account have full access privilege to the folder. To make it simple, you can create subfolders inside "My Documents". Copy your invoice template database file to each of the folders. If you are using the default template shipped with Invoice Manager for Excel, see installing Invoice Manager for Excel to find out where the files are placed. You can also download any template here on InvoicingTemplate.com. Rename the files according their purpose and usage. For example "CompanyA.xlsx" and "CompanyA-DB.mdb" etc. Optionally you can create shortcuts on Windows desktop for the templates, which allows you to open the templates from Windows desktop. To do this, right-click a template and choose "Send To", "Desktop (Create shortcut)". Connect each template with its own database file. To do this, double-click to open an invoice template. Click "Settings", and then go to the "Database" tab. Click "Open Database", browse to and open the database file that will work with the current template. Click "Yes" to save the template to make the connection persistent. Customize each of your template. See customizing invoice template for the basic rules and techniques. If you need to add new fields, visit custom fields. If you need to share data between the databases, visit how to share / link tables between Access databases. To download only the Excel template, right-click the "Download" button and then choose "Save link as" (Chrome and Firefox), or "Save target as" (Internet Explorer and Microsoft Edge), and then choose the location on your local computer. Once the file is downloaded, right-click the file and choose "Properties". On the "General" tab check "Unlock" and then click "Apply". See figure below. Without the above "unlock" procedure, opening any file downloaded online or saved from email will cause the "protected view" warning, as shown in the figure below. Since many templates here on InvoicingTemplate.com has custom fields defined, so if you download only a template without its database, the template may not work properly if you use it with an Access database shipped with other templates. If you don't have Invoice Manager for Excel installed, all buttons and reports on the template stop working. If what you need is only a free invoice template for creating invoices / bills, then you are safe to delete those buttons and reports to make the template clean. Go to Excel "Review" ribbon tab. Click "Unprotect Sheet" in the "Changes" group. Right-click a button, and then choose "Cut" from the shortcut menu. On the bottom of the Excel window, find and right-click the report name. Choose "Delete" from the shortcut menu. Adding a password to your invoice template is an easy way to keep your data safe from unauthorized users. There are several ways you can protect your Excel template. Please refer to Protection and security in Excel. Click to select a button control. Hit DEL key on your keyboard. Exit design mode by clicking the "Design Mode" button again. Save the template file by clicking the "Save" button on Excel quick access toolbar. Go to the "Forms" tab. Uncheck the "Show the 'Invoice' ribbon" option. Click "Close" to close the "Settings" window. If you want to hide the 'Delete Invoice' buttons from the normal program windows such as the list of all invoices, follow the steps below. Download one the following files. Double click hide-delete-invoice-button.reg to import it into Windows registry. If you want to unhide the 'Delete Invoice' button, use the "unhide-delete-invoice-button.reg" file. To limit access to reports, you can delete a report worksheet. 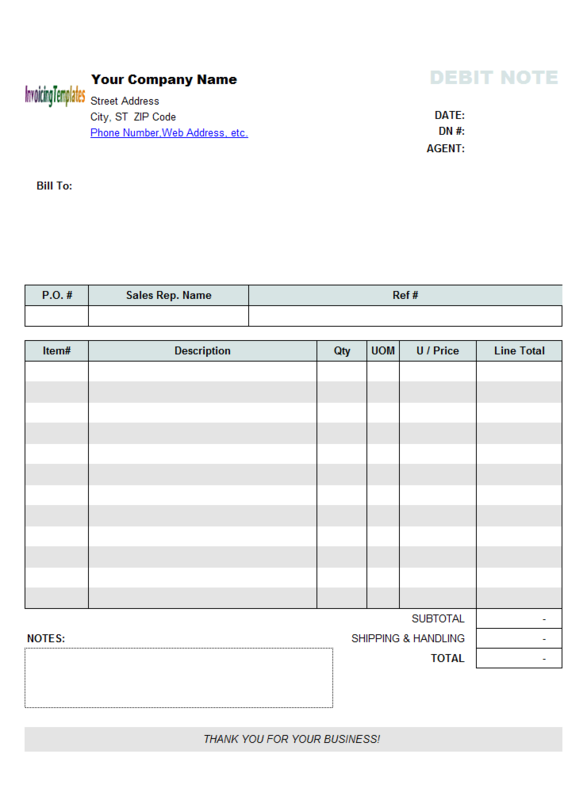 For example you can use two templates: one fully featured template for the manager, and another template with only the "Invoice" worksheet available for the sales person. To delete a report worksheet, follow the steps described below. On the button of the Excel window, right-click one of the report worksheet name. Invoices are marked as paid if the balance due field is zero. If you find your invoices are makred as paid unintentionally, check the following. If you need to keep an invoice pending, don't click the Save button on the New Payment window that pops up after you click Save To DB. If you don't want to see the New Payment window after clicking Save To DB, then uncheck the "Prompt for payment" option on the Template tab of the Settings window that can be opened by clicking the Settings button on the Invoice worksheet. If an invoice was made paid incorrectly, you can delete the payment record by going to the Invoice Edit window. To open the Invoice Edit window, click the Invoices button on the Invoice worksheet and then double-click the invoice in question. An invoice is marked as paid if its oknBalanceDue cell is zero or the cell name is missing. If you click Save To DB and the invoice is marked as paid automatically, it might be that the oknBalanceDue cell name is deleted, or the formula of the cell has been removed. To fix it, you can either download the Excel template again if your version was not customized by yourself, or you can also restore the oknBalanceDue cell and its formula manually. To restore the "oknBalanceDue" cell name and its formula manually, the follow the steps below. Make sure the Invoice worksheet is in design mode by pushing down the "Design Mode" button on the "Invoice" ribbon tab. Click to select an unused cell. Type "oknBalanceDue" into the name box on the formula bar. If oknBalanceDue cell name already exists, Microsoft Excel will select and active that cell; otherwise, the current selected cell will be named oknBalanceDue. Please note the above formula is suitable for the default invoice template only. If you are using a heavily-customized template, please use a formula that could correctly calculate the balance for your invoices. If you prefer, email us your template. We'll fix this for you. 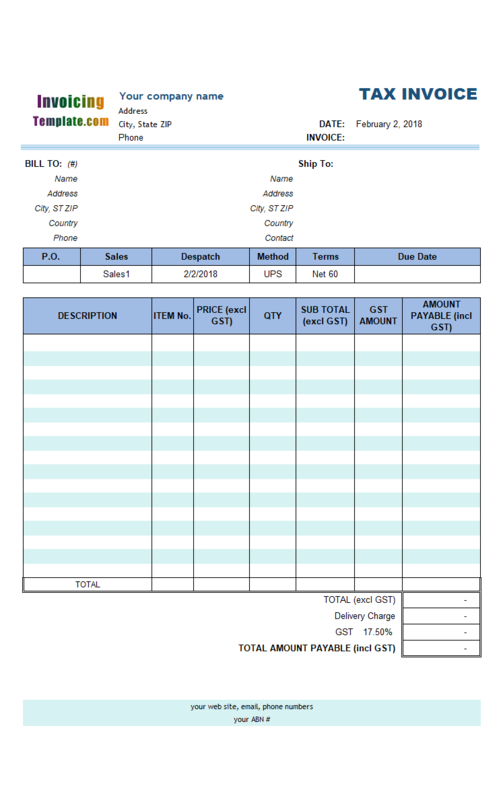 Save the invoice template once you have done the modifications. You might need to recover those invoices that were incorrectly marked as paid. Please see this document to find out how you can edit a paid invoice. TIP: If you don't want the oknBalanceDue cell to appear on your printed invoices, removing oknBalanceDue cell name or its formula is not the correct way. Instead, you can move the cell/cells out of the Print_Area. Please see: this document. How to modify / edit a paid invoice? By default Invoice Manager for Excel does not allow you to edit an invoice if it is marked as paid. To change this default behavior, follow the steps below. Invoice Manager for Excel: allow-to-modify-paid-invoices-imfe.zip. Double-click the allow-to-modify-paid-invoices-uis.reg file to import it into Windows registry. Click "Yes" when you see the following security warning. Restart Excel to make the changes take effect. If you like to disable the feature again, please download the following registry file, and then follow the steps above to import it into Windows registry. Note: Starting from version 5.26 Invoice Manager for Excel is no longer requiring the helper add-in (i.e. the UISClickProc procedure). When you click a button on the "Invoice" worksheet, Excel shows the message "Cannot run the macro 'UISClickProc'. The macro may not be available in this workbook, or all macros may be disabled." 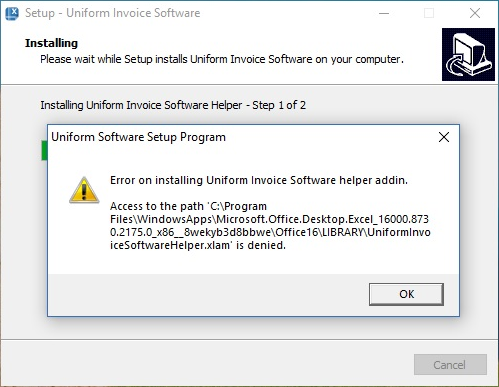 This error message occurs when Excel cannot find or run the macro 'UISClickProc' provided by Invoice Manager for Excel Helper. To fix this, check if Invoice Manager for Excel Helper is enabled. Click Excel menu File / Options. Click "Add-Ins" on the left command bar. 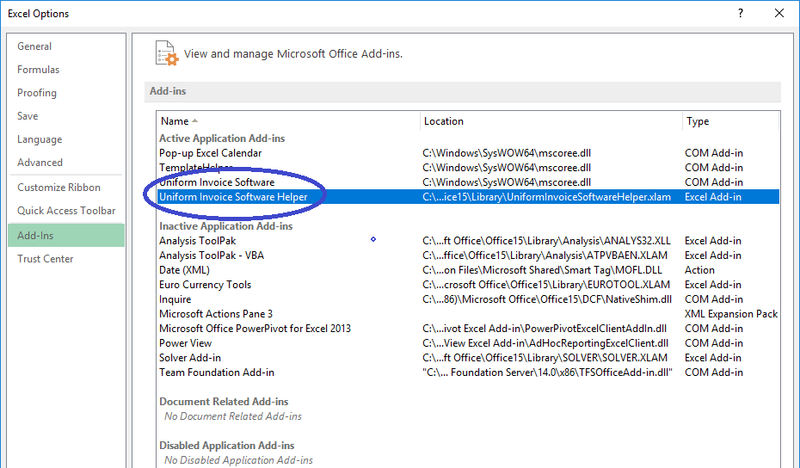 Check if "Invoice Manager for Excel Helper" is listed in the "Active Application Add-in" section on the right pane. See figure below. If not, or if this add-in is listed in the "Inactivate Application Add-ins" section, then select "Excel Add-ins" from the bottom "Manage" list, and then click "Go...". Check "Invoice Manager for Excel Helper" and click "OK". You may also need to check the security settings of Excel allow Invoice Manager for Excel Helper to run. To do this follow the steps below. Click Excel menu "File" and then "Options". Make sure all 3 option boxes are cleared (not checked). See figure. 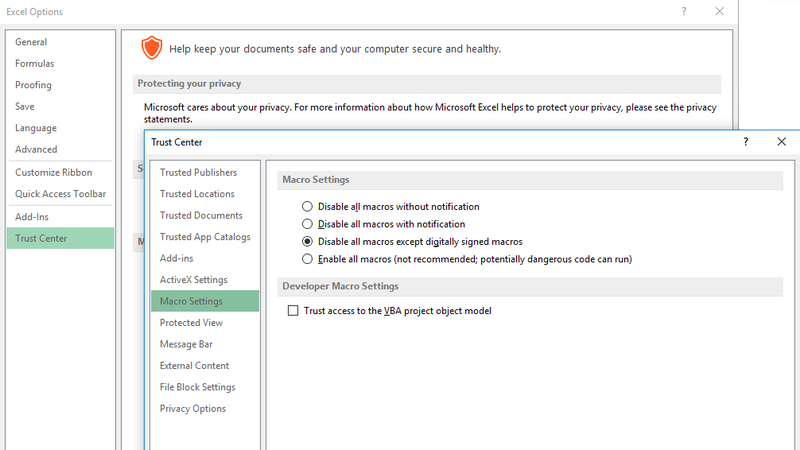 Click "Macro Settings" make sure the first two options, "Disable all macros without notification" and "Disable all macros with notification", are NOT selected. Tip: If you copied the template from another computer, or downloaded it online / from an email message, the template file might be locked by Windows by default. In this case, you need to unlock it before you can change the security and macro setting, as detailed in the How to download and use Excel template section. 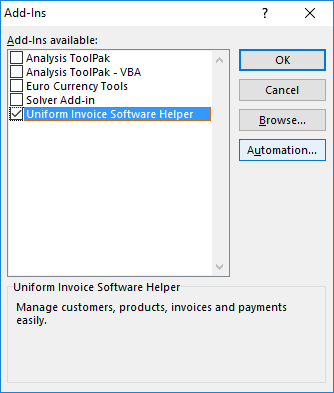 Follow these steps to install Invoice Manager for Excel helper add-in manually. First determine where your Excel's "LIBRARY" folder is. Click Excel menu "File", and then "Options". Click "Trust Center". Click "Trust Center Settings". On the right pane, you'll find where your current LIBRARY folder is. Write done this path for later use. Next, download install the helper add-in. Extract the Excel macro files from the zip package. Put the "UniformInvoiceSoftwareHelper.xlam" file in Excel's LIBRARY folder. Choose the ".xla" version if you have Excel 2007 or earlier version). You need "Administrator" privilege to copy files to the LIBRARY folder. Once you've put the "UniformInvoiceSoftwareHelper.xlam" file in the "LIBRARY" folder, start your template and try it. Next, you have to enable the Excel add-in by following steps described here. When installing Invoice Manager for Excel Helper, you may encountered the error message shown below. To deal with this error, you need to first make sure you're running the installer program using a Windows Administrator account or an account that is a member of Windows admin group. Secondly, Invoice Manager for Excel runs inside Microsoft Excel as a COM add-in program, which requires the full locally installed Excel/Office. This means that, a client version of Office 365 subscription plan without installing the local Excel/Office will not work. Left part - this is a task pane. You can hide it by pushing down the "Hide task pane" button on the "Invocie" worksheet. Right part - they are general Excel text cells. You can clear them by following these steps: first select the cells, and then on Excel "Home" ribbon tab, choose "Clear" from the "Editing" tab. Note : Don't delete / clear clles on the first row (i.e. the cells starting with "Current Database"), but you can hide those columns if you want. Download the new template from invoicingtemplate.com. Save the template to the folder where your database file was stored. Go to the "Database" tab. Browse to and open the database file that you use with your old template. Once the new template successfully connected with your original database, save the template once by clicking "Save" on Excel quick access toolbar. If the old template and new template don't have the database structure, you have to apply custom fields defined in the new template to the original database file before you can use the new template with the original database file. Learn more about Custom Fields, or contact us for assistance. In design mode Microsoft Excel creates/records macros automatically when you double-click a shape object, like a button or an image object. The macros are usually empty - i.e. they don't contain any useful code. Invoice Manager for Excel is a COM add-in program that does not use macros. Since the 2007 version Excel distinguishes macro-enabled and macro-free files with different extensions. Here on InvoicingTemplate.com, most templates are published in ".xlsx" format that prevent users from saving macro code to the spreadsheet file. So the ".xlsx" format avoids the issues with auto-creaed macros completely. On the other hand Invoice Manager for Excel still supports ".xls" format, and there are still users choose this traditional spreadsheet format. The auto-created macros causes problems / warning if you are using ".xls" format or other macro-enabled format such as ".xlam". First, to prevent Excel from creating macros automatically in design mode, try to click the controls (buttons, images etc.) slowly, so as to ensure that Excel does not think you are double-clicking the control. Secondly, to remove those auto-created macros from your invoice template, follow the steps below. Unprotect the Invoice worksheet. For information about how to do this in Excel, see Protection. Press ALT+F11 key on your keyboard. 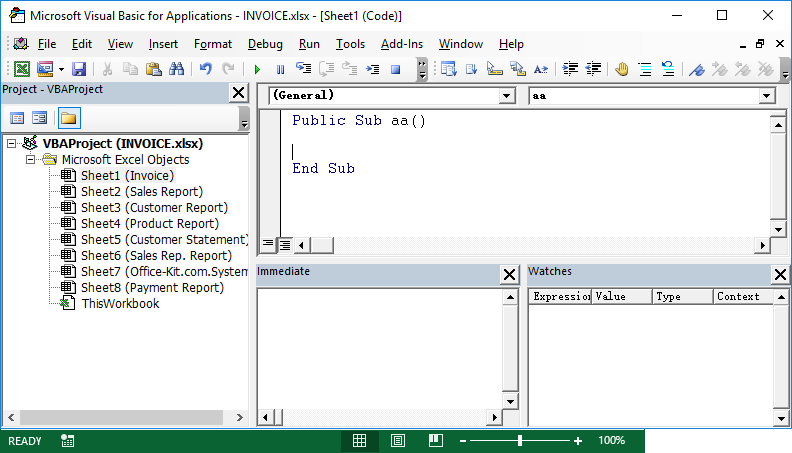 This opens the Microsoft Visual Basic macro editor of Excel. Double-click a sheet name (say Invoice) in the Project pane. 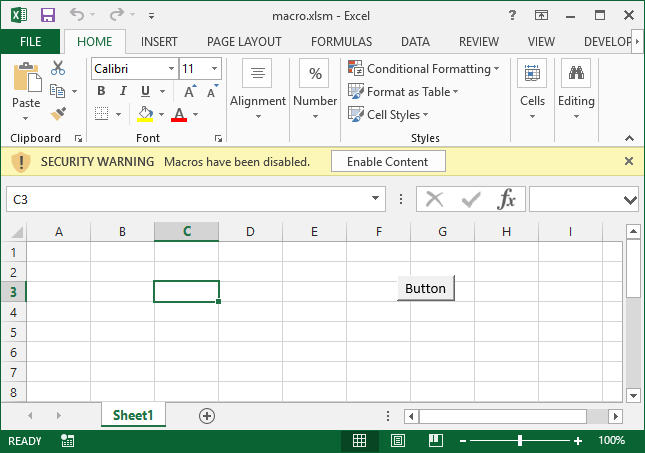 Excel displays the macros contained in the sheet in the right pane. Click the right pane to activate it. Press CTRL+A on your keyboard to select all the macros. Press DEL key on your keyboard to delete all the macros. Repeat step 4 - 7 for each worksheet in your template. Click menu File / Save. Click menu File -> Close and Return to Microsoft Excel. This closes the macro editor and returns you to Excel. Exit Excel and re-open the invoice template. The security warning message disappears. If you run several templates and databases on one computer, such as for multiple companies or currencies, it may be helpful to share tables between databases. Sharing the cutomer or product tables allows you to update the customer or product list only once and have the updates appear in more than one databases and be available in all the related templates. This can be accomplished by linking tables between Microsoft Access databases. The following tutorial assumes you have two databases, DB1.mdb and DB2.mdb, and two invoice templates, Template1.xlsx and Template2.xlsx are connecting to the two databases respectively. DB1.mdb will contain real data, and DB2.mdb contains only a linked Customer table. Your updates to Customer table via either template will be visible in both databases and templates. First of all, backup your database files in Windows Explorer, so that you can easily restart again in case something is wrong during the process. Double-click DB2.mdb, the database which will contain the linked table, to open it in Microsoft Access. In the Tables list, click and select the Customer table. Press the DEL key on your keyboard to delete it. In Access 2007, click "Access" on the "Import" group on the "External Data" ribbon tab. Specify the source database path and name (in this case, DB1.mdb), choose "Link to the data source by creating a linked table". Click OK.
On the Link Tables dialog box, choose Customer table and click OK. The Product database table can be shared in the same way. With this setting, updates you make to DB2.mdb (via Template2.xlsx) are actually made in the DB1.mdb, and the updates are visible to both templates. Some templates like c4091 shows a background image when it is printed. If you want to remove the image, here are the steps to follow. Go to the "Page Layout" ribbon tab. In the "Page setup" group, click the arrow button at the bottom-right corner. This opens the "Page Setup" dialog box. Delete the symbol "&[Picture]" from the "Left section", "Center section" and "Right section" boxes, if any. If you cannot find the "&[Picture]" symbol, just skip this step. Repeat step 5 – this time you click "Custom Footer". Repeat step 6 and 7 to clear pictures from the custom footer, if any. Debit Note Template is a general purpose Excel-formatted template for creating professional debit note with easy and quick. The debit note form has 6 columns on it, including item#, description, quantity, UOM (Unit of Measure), Unit Price and Line Total. 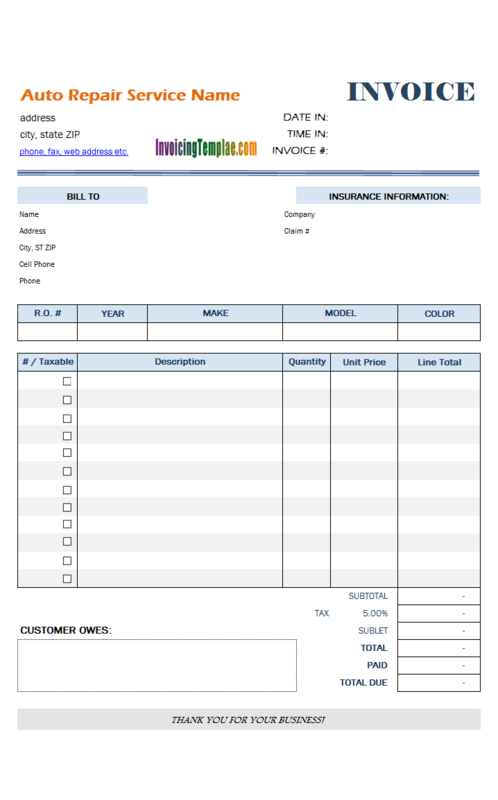 Auto Repair Invoice Template is a free blank auto repair invoice form that allows you to create auto repair invoices with easy and quick. The auto repair invoice form includes fields for vehicle information.